Welcome to Snape_Lims, a Last Icon Maker Standing icon competition. Every challenge you'll enter an icon using a picture of a scene featuring J.K Rowling's mysterious character, Severus Snape. • Put "I may vomit." in your comment somewhere so we know you've read the rules. • Signing up ends on Friday 25th May, so make sure you've done so by then! 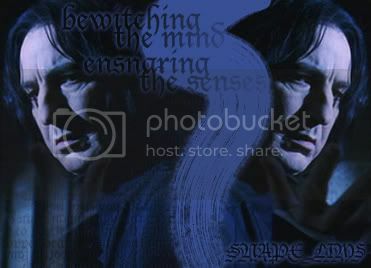 • When a new challenge is posted, I will give you a picture of Snape. • You have to make an icon out of the picture supplied. Blending with other pictures/caps is not allowed, unless stated otherwise. • Winners will be posted two days after the voting goes up, along with a mod's choice. If your icon does not make it through you'll be eliminated from the LIMS, and can not enter any of the next challenges of that round.